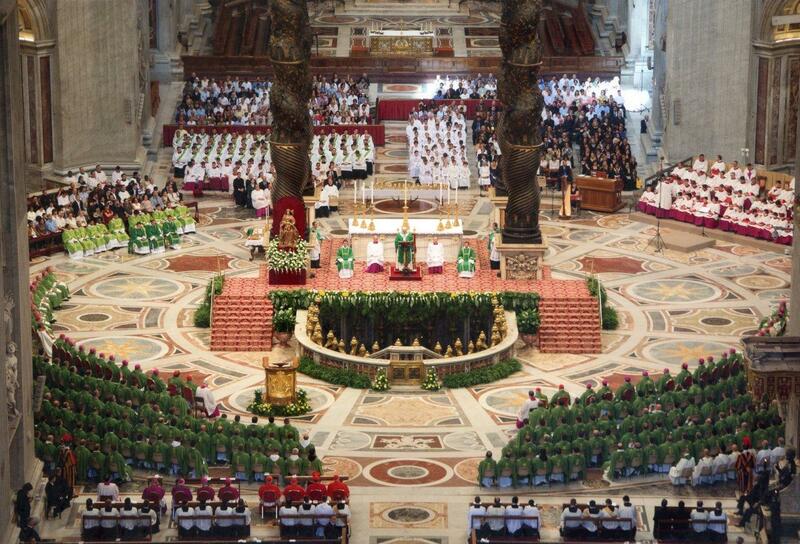 Directly behind Pope Francis setting his chalice on the altar - it was quite heavy! I got some more photos from the mass with Pope Francis, and wanted to pass them along. I’ve already told you about meeting him before mass on the 7th, but I’d wanted to tell you about Pope Francis during the mass itself. 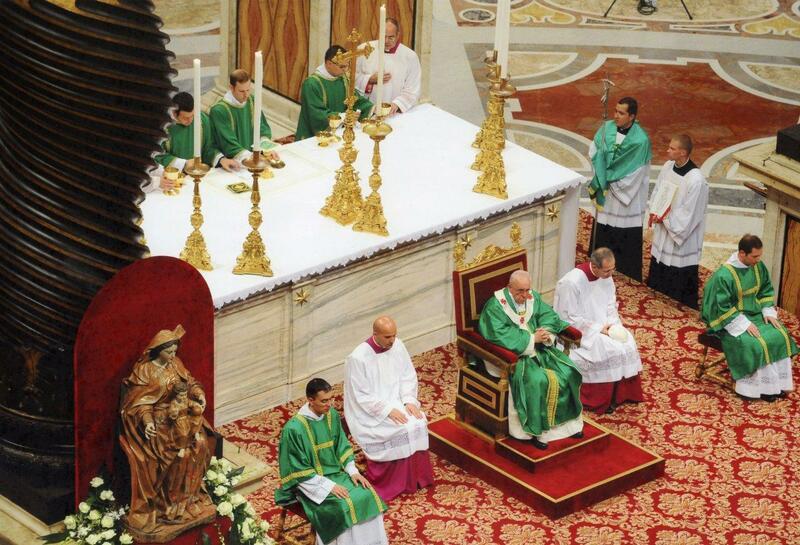 Like I’d said, before Mass Francis was all joyful and talkative and smiling at everybody. But once the mass started, it was like he became a different man. As we processed in, people were hanging over the rails trying to get a picture or touch the him. 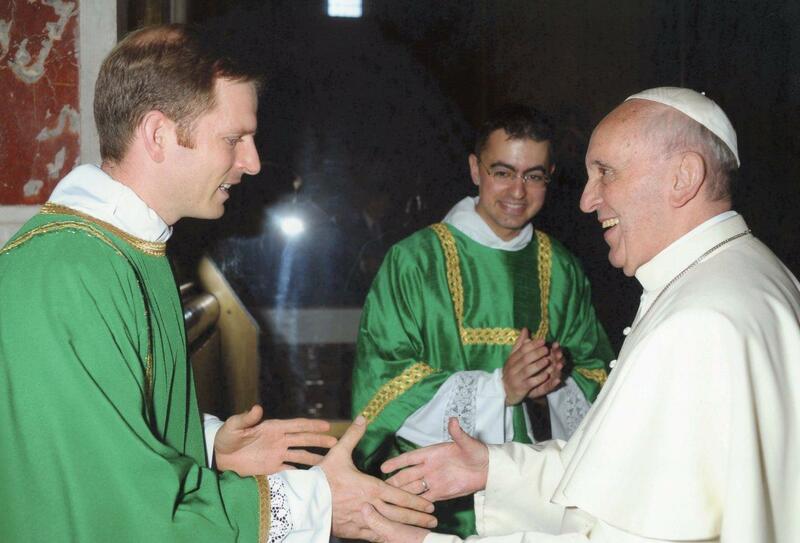 But Francis didn’t wave or walk around greeting people like he does out in the square at audiences. He walked straight down the aisle. And once he started the mass, his voice dropped and became quiet, almost “dreamy” I’d say. He spent the rest of the mass like that. When he met you before mass, he looked you right in the eye, but during mass, he was focused on something else. It was as if before when he met you, you were everything for him, but during mass someone else was everything for him, and you were just looking on. During the consecration, I got to do the incense. Six altar boys and I processed to the very middle of the basilica, to directly in front of Saint Peter’s tomb, where we knelt down. When Pope Francis said Jesus’ words: “This is my body… do this in memory of me”, he held up the Eucharist for a good while so that everyone could adore our Savior present in the bread and wine. From where I knelt, the vista was tremendous. I could feel the whole congregation of thousands behind and around me in prayer, everyone hushed in silence. Just a few steps down in front of me rested the bones of the prince of the Apostles, Saint Peter, the rock on which Jesus said he would build his Church. Next in my line of sight was the altar, with the golden crucifix on top. 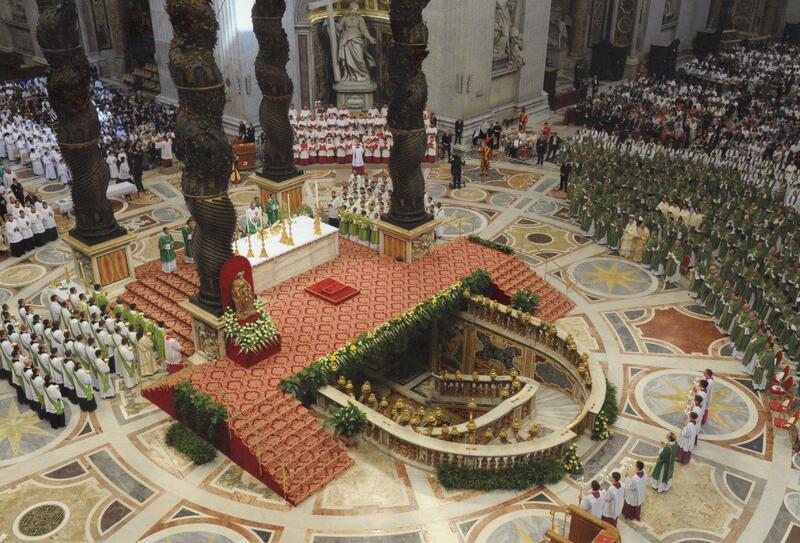 Behind the crucifix was the Holy Father, holding Jesus aloft. Directly behind him was Bernini’s alabaster window of the Holy Spirit, with wings outstretched, encompassing the whole scene. It was more than unearthing. In that moment, as I swung the incense-laden censer before our Lord present in the Eucharist, I realized a few things. First of all, we weren’t adoring the man in white, we were adoring the white host. The Pope is a really important person, we’d even call him Jesus’ vicar on earth, but he’s not God. In John chapter 6, Jesus told us he was the bread of life, and that whoever would eat this bread would live forever, and that this bread is his flesh for the life of the world. 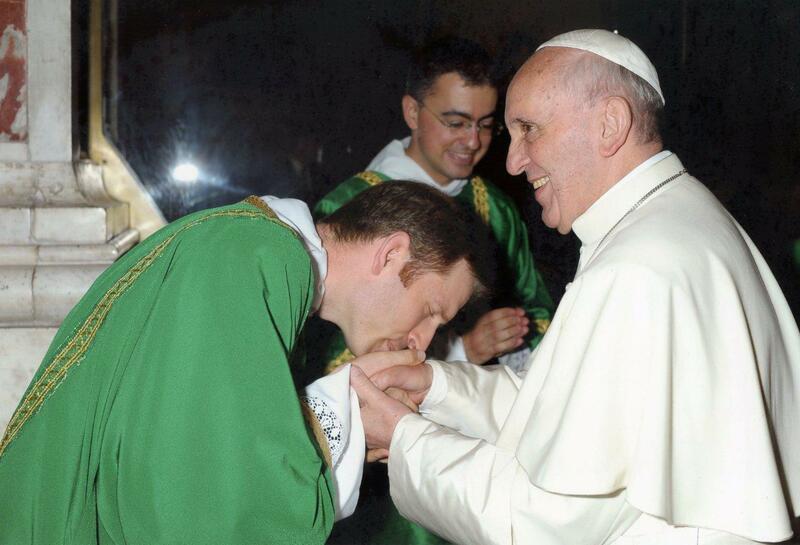 The host in the Holy Father’s hands was way more important than the Holy Father himself. We were kneeling because of God present there, not because of the man. Second, like never before I felt united with all of heaven and earth. All the angels and saints are present at every mass, but in Saint Peter’s, at that moment, swinging that censer, the intense reality of it all struck me like an avalanche. And that was the third thing. Each mass is a re-living of Jesus’ sacrifice on Calvary. Each mass makes his one sacrifice present again, and makes us present at Calvary. So this tremendous moment I was sharing was not something that would just pass and never come again and which I would just have to be nostalgic about in the future. No. It was, is, something I will live again and again, in every mass I attend, in every mass I assist at as deacon, in every mass I hope to celebrate in the future as a priest, no matter where or when. There is really just one mass. 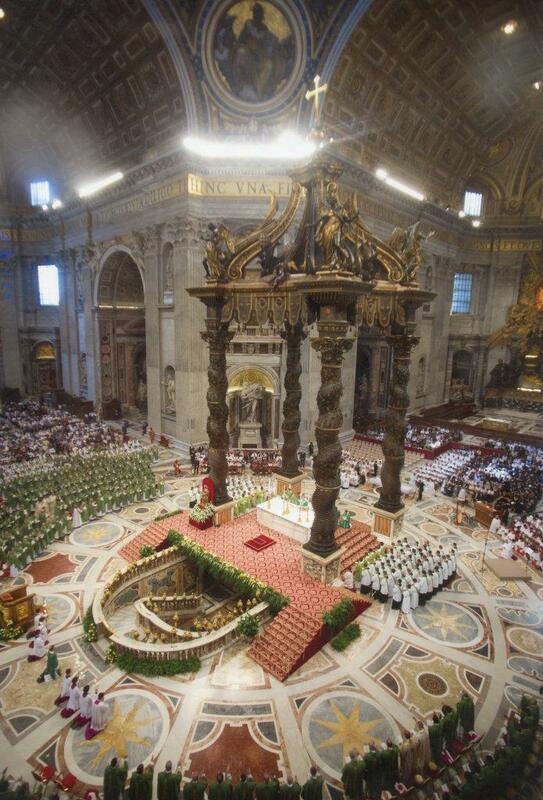 This is all hard to explain, but at every mass ever since that moment under the dome of Saint Peter’s I’ve felt truly present there, “one in spirit” with the Pope and all believers. Pope Francis only gave communion to us five deacons, and as he gave me communion, I tried to remember, “the important one is in the host”. 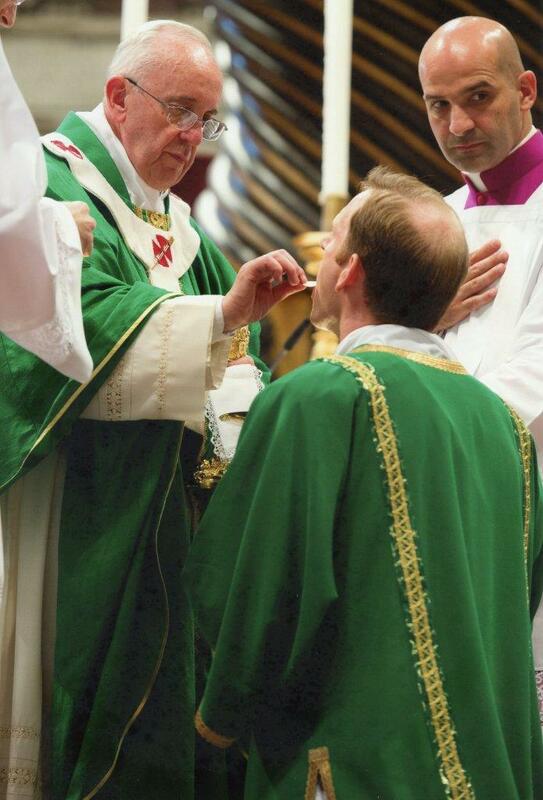 And it wasn’t hard to remember, because as Francis laid the host on my tongue, he wasn’t looking at me, he was looking at the host, continuing his adoration of Jesus present in the Eucharist. As we processed out, Francis seemed to open up and he greeted the people as he made his way down the aisle. He was his normal cheerful self again. I’m so grateful for the chance to have been able to be there and to witness firsthand how our Holy Father celebrates the most important moment of his day, the mass. 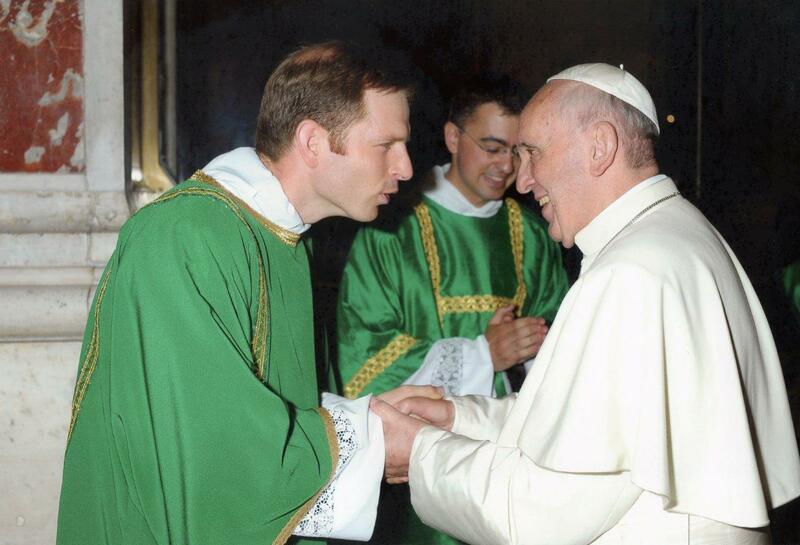 He’s a great example for future priests, and for every one of us! Let’s all try to live this special moment like it should be lived. Just try it! – try to enter into your own prayerful recollection like our Holy Father does. Today is the 19th anniversary of my going off to the seminary. What a leap of faith that was, especially for my parents! (as a twelve-year-old, I just assumed they’d be fine with it!) But I think God knew well why he was moving our hearts, and the experiences of every day just seem to reaffirm for me that I’m right where he wants me. Enjoy the photos, and God bless you!